Loosely based upon the real life crimes of American serial killer Henry Lee Lucas, John McNaughton’s Henry: Portrait of a Serial Killer (1986) takes a chilling and disturbing look at the fractured psyche of a severely unhinged individual. Rather than creating a direct interpretation of the murderous exploits of Lucas (Michael Rooker), McNaughton opts to paint a picture of a man lacking any sense of emotion or remorse at his brutal attacks, resulting in a film that is – at times – difficult to watch. The story centres on Henry and his equally unhinged house mate Otis (Tom Towles). While Otis initially appears to be relatively harmless in comparison to Henry, his behaviour begins to take on a somewhat perverse turn upon the arrival of his younger sister Becky (Tracy Arnold), who comes to stay with him following her husband’s imprisonment for murder. As Henry’s murderous urges begin to escalate, so too does Otis’ incestuous lust for his sister, with his advances upon her becoming increasingly unsettling. The pair subsequently embark on a series of murders together, culminating in one of the film’s most terrifying moments, in which they record themselves torturing and murdering a family in their own home, with Otis attempting to perform an act of necrophilia. Even more so than the scenes of extreme brutality, it is Michael Rooker’s performance as Henry that provides Portrait of a Serial Killer’s most affecting moments. From the moment he appears on screen, Rooker’s presence emanates what can only be described as an intimidating chill, offering a portrayal as disturbing as they come. One of the film’s minor flaws is in the unconvincing suggestion of romance between Henry and Becky. Their relationship develops in an extremely unlikely fashion, especially given the fact that she seems to take a liking to him almost immediately after being told he was recently released from jail for killing his own mother. 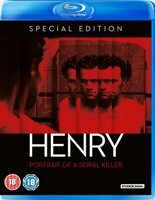 Slight grievances aside, Henry: Portrait of a Serial Killer is as terrifying an insight into the mind of a killer one is likely to encounter. With a host of special features, including in depth interviews with cast and crew, this is one of the DVD/Blu-ray releases of the year.